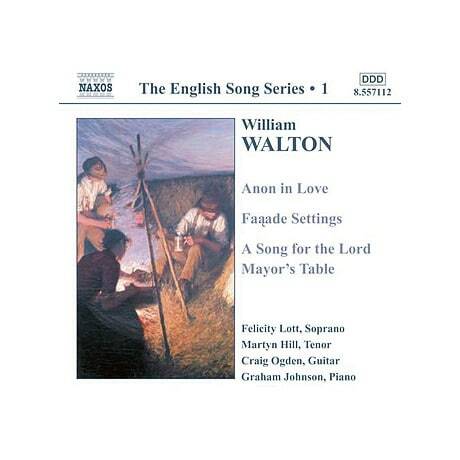 For lovers of art songs, this 1997 CD of song settings by William Walton (1902-83) is a must-have. In the years between the wars, Walton won a succ&eagrave;s de scandale with Façade, a collaboration with poet Edith Sitwell that amused the cognoscenti and shocked wider audiences. Included here are six songs from it: "Through Gilded Trellises," "Daphne," "Long Steel Grass," "Popular Song," "Tango-Pasodoble," and "Old Sir Faulk." The program also contains Anon in Love—settings of 17th- and 18th-century poems for tenor and guitar—and selections from A Song for the Lord Mayor's Table, featuring soprano Felicity Lott.